This superb product was first brought to my attention by a client. Not only did this client praise the product but she also made kind comments about the helpful advice and help given by Zoe. I HAVE NO HESITATION IN RECOMMENDING DOGMATIC TO ALL DOG OWNERS WHO WISH TO HAVE COMPLETE BUT GENTLE CONTROL OF THEIR DOGS IN PUBLIC. WHO COULD IMAGINE A HORSE WITHOUT A HALTER? I CANNOT NOW IMAGINE A DOG BEING WALKED WITHOUT A DOGMATIC HEADCOLLAR. Dr David Sands is a human-companion animal practitioner at the Animal Behavioural Clinic (Chorley, Lancashire) specialising in the treatment of behavioural problems displayed by dogs, cats, birds, horses and exotic animals and undertakes home visits in the North of England including Lancashire, Merseyside, Greater Manchester and Yorkshire. 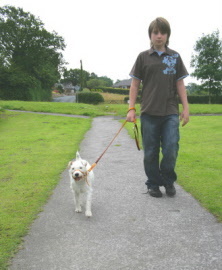 Expertise includes behavioural assessment and treatment of companion animals including aggression (behaviour that falls under The Dangerous Dogs Act) and animal ‘emotional behaviours’ such fixation and obsessive compulsive-like disorders, (stress), noise phobia and over-dependency on owners (separation-related disorders). David produces Behaviour-modification Programs and is an Expert Witness in court. He is an internationally established animal-related author and photographer, researching ‘human psychology’ and zoology. David gained his doctorate in ethology for animal behaviour research at the Faculty of Science, Liverpool University. He is a Fellow of the Canine and Feline Behaviour Association (FCFBA), a Council member of the PETbc and a member of the Association for the Study of Animal Behaviour (ASAB). Dr Sands, as a author and photographer, has scripted a number of animal information videos on small animals, dogs and cats and contributed to and written many books including: Cats and Kittens, Dogs and Puppies and, ‘To The Rescue - Dogs, ‘To The Rescue - Cats’, guides to providing a rescue or re-homed dog or cat a new life. He has authored ‘The Family Dog book’ (Collins) and the ‘Encyclopaedia of the Family Cat’ (Collins) and The German Shepherd Dog ‘Care and Behaviour’ (Crowood Press in 2004). His best-selling feline book is ‘500 questions CATS’ (Hamlyn) which answers questions about cats and behaviour. His most successful book, Know Your Dog, based on current research into canine DNA and behavioural studies, has been published in many languages and in USA and Canada editions (Octopus-Hamlyn 2008 English edition due out in Kindle 2012/13). 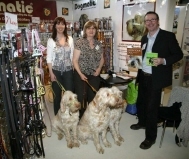 Dogmatic were delighted that Dr David Sands stayed at our stand and offered his support at the Pet and Aquatics Trade Show in Harrogate. Dr Sands endorses the Dogmatic and recommends it as the Headcollar of choice in his book 'Know Your Dog'. Pictured with Dr Sands, Zoe Lewsley, Susan Lewsley (who designed the Dogmatic) and our 3 generations of Italian Spinoni Kofi (Montecani Moon Storm at Estover), Archie (Elgin’s Mezzaluna at Estover) and Norman (Hincott Summer Skies at Estover). The boys behaved impeccably throughout the Show and thoroughly enjoyed modelling our range and being ‘the faces’ of Dogmatic! Click the album below the thumbnail for more photos.